DiCre excision led to viable parasites but with a 50% reduced multiplication rate. There was an egress phenotype, with premature rupture of the host membranes and a failure of the merozoites to separate efficiently. Live cell imaging. (A) Left: live cell imaging of the PV1-GFPINT transgenic line. (B) Upper panel, colocalisation of PV1-GFP chimera with PfExp1. Lower panel, colocalisation of PV1-GFP chimera with PfSERA-5. In merge and overlay: GFP, green; specific antibody, red; Hoechst, blue. Immunofluorescence co-localisation using antibodies against the PV and PVM markers SERA-5 and Exp-1 respectively verified that this fluorescent signal represented the PV.Chu T, Lingelbach K, Przyborski JM. Genetic evidence strongly support an essential role for PfPV1 in intra-erythrocytic growth of P. falciparum. PLoS One. 2011 6(3):e18396. 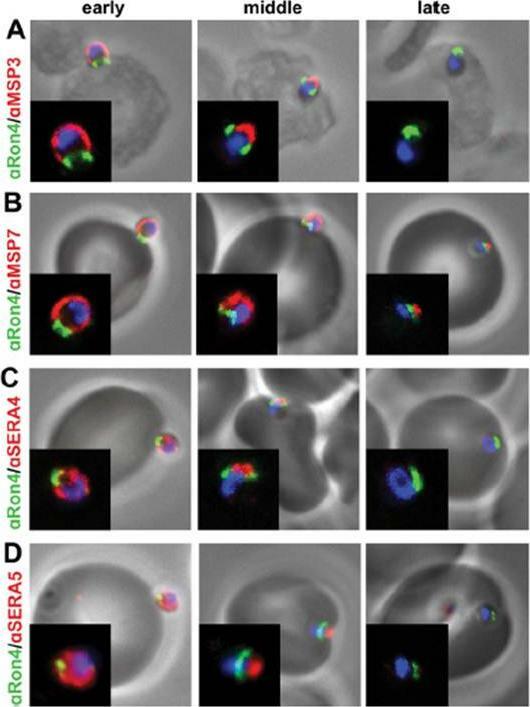 Co-localization of lipid bodies with the parasitophorous vacuole marker protein SERA. (A) Fluorescent microscopic analysis of schizont-stage P. falciparum-infected erythrocyte stained with Sudan III and anti-SERA Ab. From left to right, panels represent bright-field overlaid with DAPI, Sudan III, SERA and overlay of Sudan III and SERA. Yellow areas denote regions of overlap. Single-stained cells (top two rows) exhibit virtually no fluorescence with the opposing filter.Palacpac NM, Hiramine Y, Mi-ichi F, Torii M, Kita K, Hiramatsu R, Horii T, Mitamura T. Developmental-stage-specific triacylglycerol biosynthesis, degradation and trafficking as lipid bodies in Plasmodium falciparum-infected erythrocytes. J Cell Sci. 2004 117:1469-80. 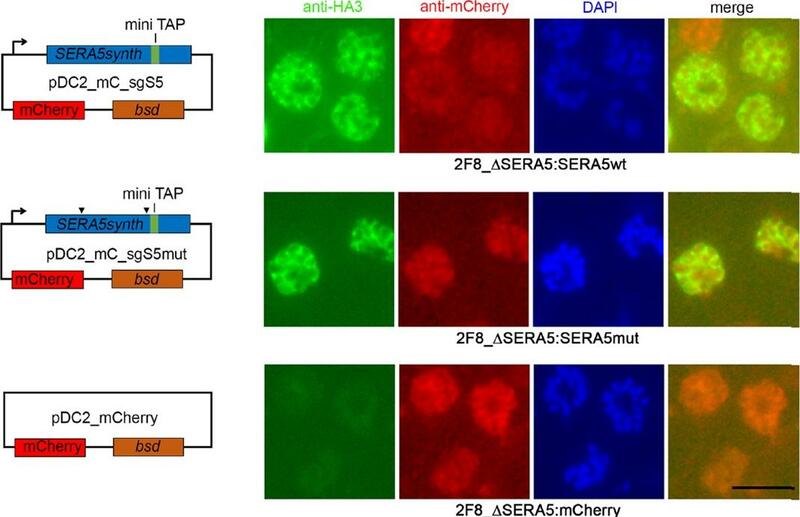 SBP1 (SERA5 targeting peptide) colocalizes with SERA5 within the parasitophorous vacuole of mature blood-stage parasites. Late trophozoites (A) or schizonts (B) were probed with biotinylated SBP1 (column 1; green) and MAb 3E8 (column 2; red). Parasite nuclei (column 3) were stained (blue) using the DNA stain Hoechst 33258. 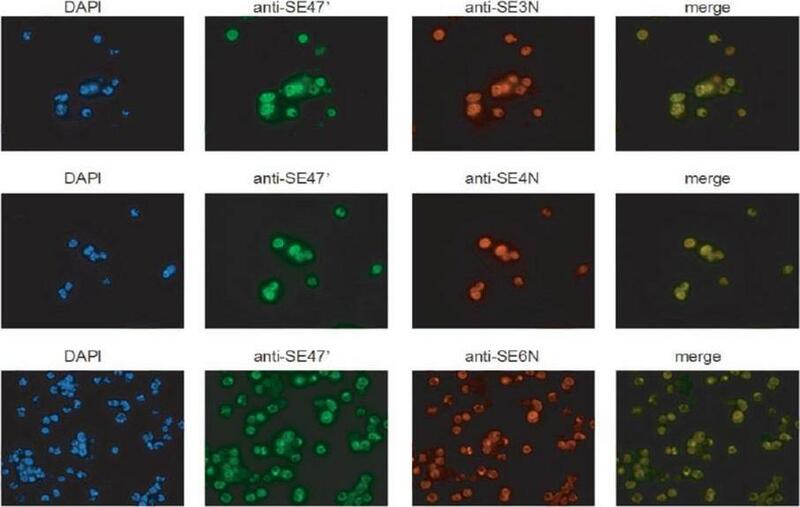 Areas of colocalization for SBP1 and SERA5 are observed as yellow areas (column 4) in the superimposed fluorescence patterns for biotinylated SBP1 and MAb 3E8. The transmission images of parasites viewed using light microscopy are shown in column 5. Bar, 2 mm. SBP1 sequence: LVCHPAVPALLCAR.Lower panel: Immuno-EM images of synchronized parasites cultured in the presence of biotinylated SBP1 (710 M). Sections were probed with MAb 2F3 (to detect SERA5) and avidin (to detect biotinylated SBP1) and visualized using 18-nm and 10-nm gold beads, respectively. SERA5 was generally restricted to the parasitophorous vacuole.Fairlie WD, Spurck TP, McCoubrie JE, Gilson PR, Miller SK, McFadden GI, Malby R, Crabb BS, Hodder AN. Inhibition of malaria parasite development by a cyclic peptide that targets the vital parasite protein SERA5. Infect Immun. 2008 76:4332-4344. Test of Ag2 localization by immunoeleclron micrography. 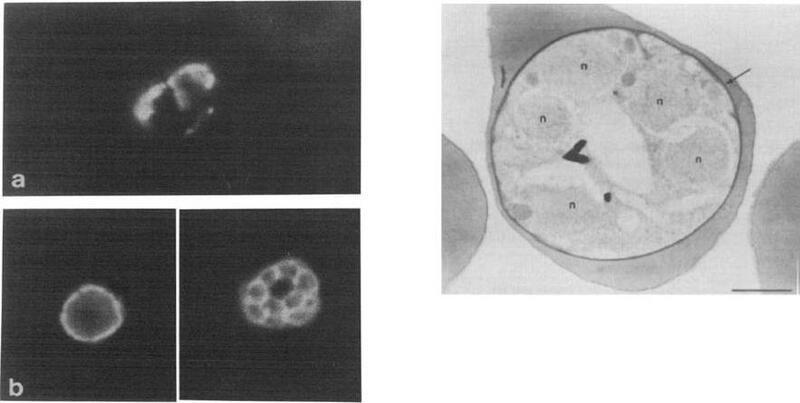 Electron microscopy micrographs was performed on sections whjch were reacted wiih rabbit anti-Ag2 sera and goat anti-rabbit IgG conjugated to gold particles. A: The schizont membrane is labeled with gold particles (arrow) x30.000. B: Gotd parlicles larrow) are seen on the parasitophorous nembrane and in the space of the parasitophorous vacuole x45,000. C: Gold particles are present within a cleft (arrow) x 36,000.Jakobsen PH, Grellier P, Theander TG, Behrendt N, Torii M, Aikawa M, Schrevel J, Jepsen S. Identification and localization of a soluble antigen, Ag2, of 136 kDa from Plasmodium falciparum in vitro cultures. APMIS. 1991 99:155-62. Copyright John Wiley & Sons Ltd. 2010. 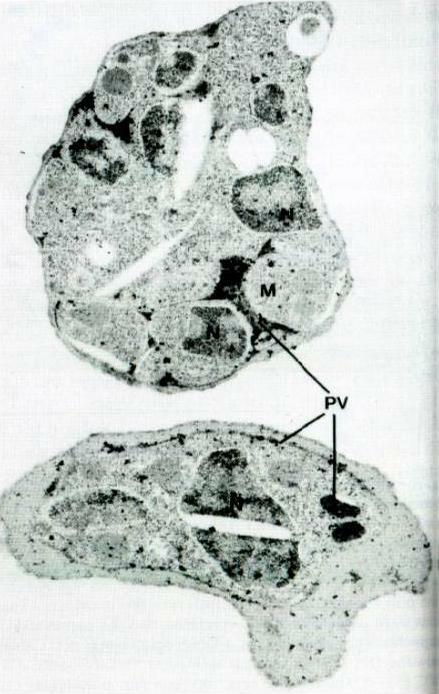 Immunoelectron micrograph of a P. falciparum schizont section reacted with an antiserum against the fusion protein expressed by pEX140-1. (N, nucleus; M, merozoite; PV, parasitophorous vacuole), x 18000. pEX140-1 codes for 33 kDa polypeptide resulting from the fusion of the SERA5 cDNA and the lgt11 plasmid. 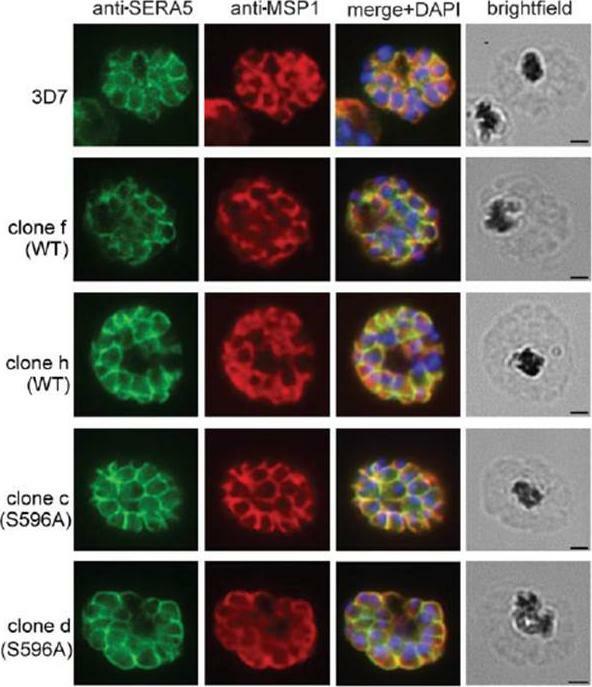 Sera5 is located mainly within the parasitophorous vacuole. Additional labelling of the parasite surface as well as the vacuolar membrane cannot be excluded.Knapp B, Hundt E, Nau U, Küpper HA. Molecular cloning, genomic structure and localization in a blood stage antigen of Plasmodium falciparum characterized by aserine stretch. Mol Biochem Parasitol. 1989 32:73-83. Copyright Elsevier 2010. The RAP1-35 construct, GFP is trafficked to the PV. RAP1-35-GFP was targeted to the parasitophorous vacuole (PV), the default destination for the secretory pathway, where it is co-localized with SERA5.Richard D, Kats LM, Langer C, Black CG, Mitri K, Boddey JA, Cowman AF, Coppel RL. Identification of Rhoptry Trafficking Determinants and Evidence for a Novel Sorting Mechanism in the Malaria Parasite Plasmodium falciparum. PLoS Pathog. 2009 5(3):e1000328. 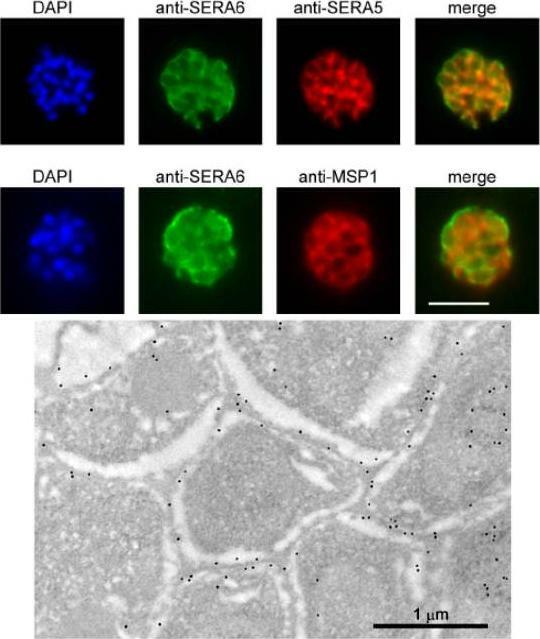 SERA6 is a soluble parasitophorous vacuole (PV) protein which may partially interact with the PVM. 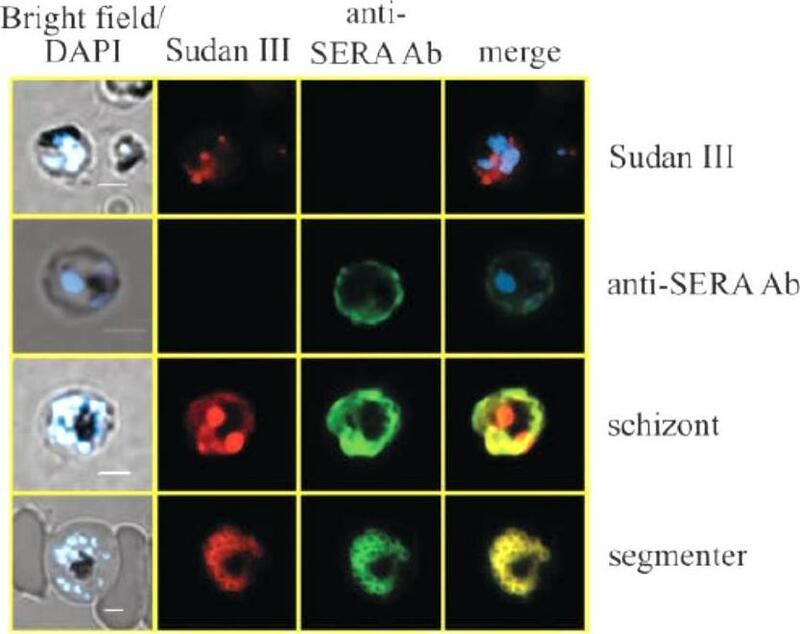 Upper panel: IFA demonstrates colocalization of the anti-SERA6 and anti-SERA5 signal in mature schizonts, except that the SERA6 signal additionally shows an association with the outer confines of the intracellular parasite, probably corresponding to the PVM. Scale bar, 5 μm. Lower panel: Immuno-electron microscopic localization of SERA6 in a P. falciparum schizont, using the anti-S6C1 antibodies labelled with 10 nm immunogold. The majority of the signal is clearly associated with the peripheral space between intracellular merozoites, consistent with a PV localization. Magnification, x 15000.Ruecker A, Shea M, Hackett F, Suarez C, Hirst EM, Milutinovic K, Withers-Martinez C, Blackman MJ. 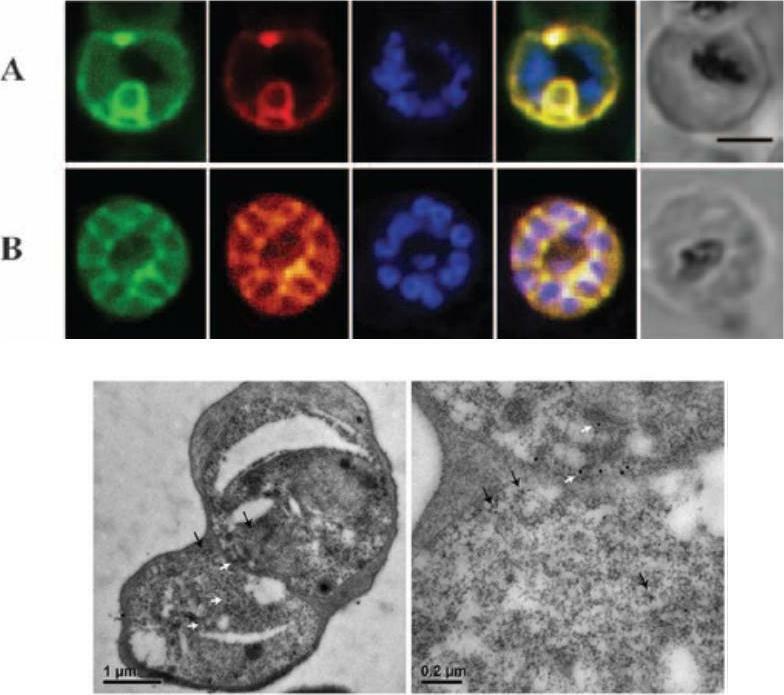 Proteolytic activation of the essential parasitophorous vacuole cysteine protease SERA6 accompanies malaria parasite egress from its host erythrocyte. J Biol Chem. 2012287(45):37949-63. SERA3–6 genes are expressed in single parasites at similar localization. Trophozoite- and schizont (Honduras-1)-infected erythrocytes were purified by Percoll and subjected to immunofluorescence staining with rabbit anti-SE3N, -SE4N, or -SE6N antiserum and mouse anti-SE47’ (SERA5) IgG. The secondary antibodies used were Cy3-conjugated anti-rabbit IgG and fluorescein isothiocyanate-conjugated anti-mouse IgG. 4’,6’-Diamidino-2-phenylindole was also used to stain parasite nuclei.Aoki S, Li J, Itagaki S, Okech BA, Egwang TG, Matsuoka H, Palacpac NM, Mitamura T, Horii T. Serine repeat antigen (SERA5) is predominantly expressed among the SERA multigene family of Plasmodium falciparum, and the acquired antibody titers correlate with serum inhibition of the parasite growth. J Biol Chem. 2002 277:47533-40. PfCDPK1 is expressed throughout erythrocytic schizogony as detected by by immunofluorescence assay (IFA). PfCDPK1 was detected in blood stages of P. falciparum by IFA using anti-PfCDPK1 mouse sera and Alexa Fluor 488-conjugated anti-mouse IgG goat sera (green). 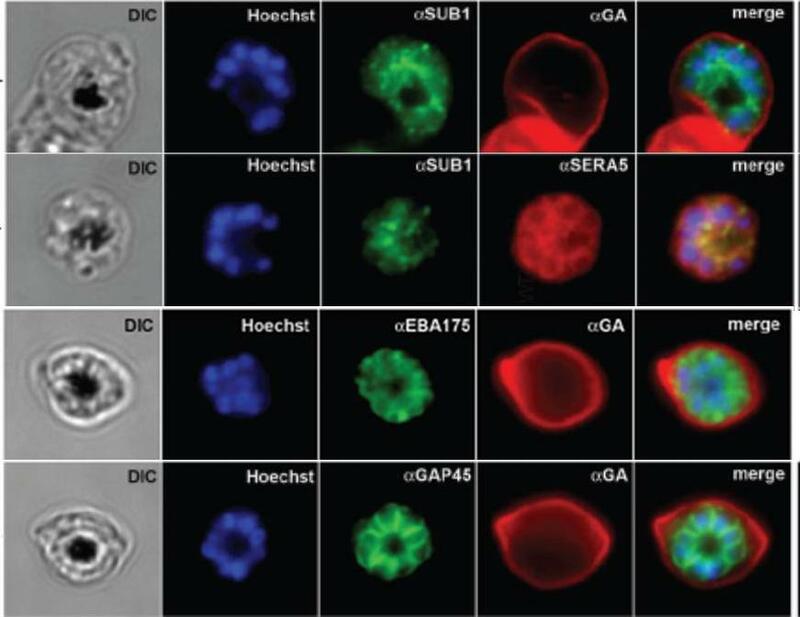 Anti-SERA5 rabbit sera and Alexa Fluor 594-conjugated anti-rabbit IgG goat sera (red) were used to localize the parasitophorous vacuole (PV) protein SERA5. Nuclear DNA was counterstained with DAPI (blue). Bright field (DIC) merged with DAPI (DIC + DAPI), fluorescence images detecting PfCDPK1 (PfCDPK1) and merged fluorescence images detecting PfCDPK1 and DAPI, PfSERA5 and DAPI or PfCDPK1, PfSERA5 and DAPI (Merge) are shown. Bar represents 2 mm (ring, trophozoite, schizont) or 1 μm (merozoite). PfCDPK1 localized to the rim of the infected erythrocyte and appeared to be associated with the erythrocyte membrane in rings and trophozoites (lower panel). 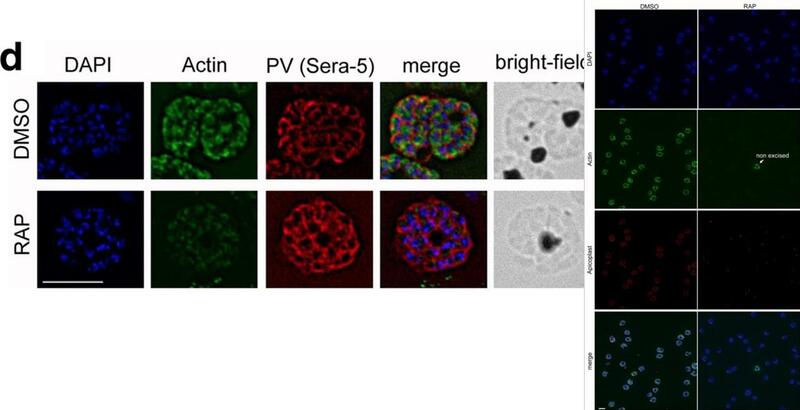 In addition, PfCDPK1 was found in the parasitophorous vacuole (PV) and co-localized with SERA5, a known PV protein in trophozoites. Inmerozoites, PfCDPK1 was primarily found at the boundary of the merozoite at the merozoite plasma membraneBansal A, Singh S, More KR, Hans D, Nangalia K, Yogavel M, Sharma A, Chitnis CE. 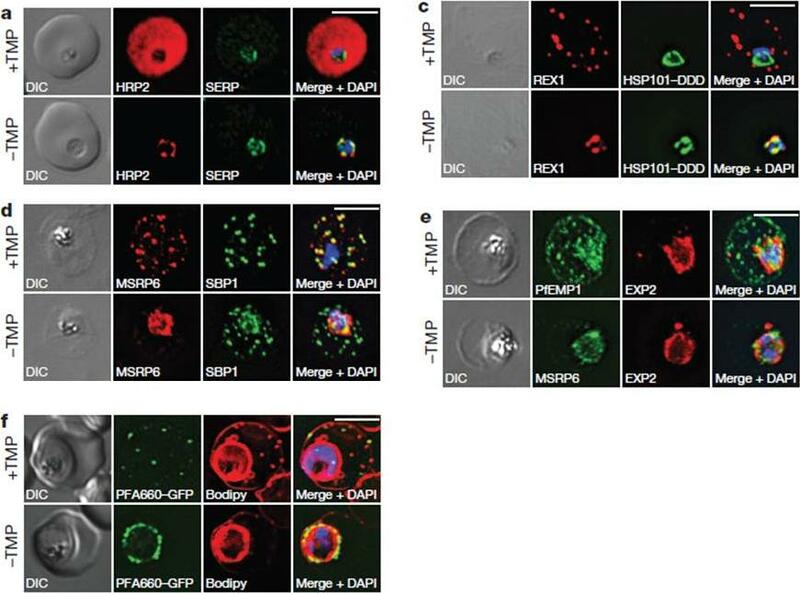 Characterization of Plasmodium falciparum calcium dependent protein kinase 1 (PfCDPK1) and its role in microneme secretion during erythrocyte invasion. J Biol Chem. 2013 288(3):1590-602. 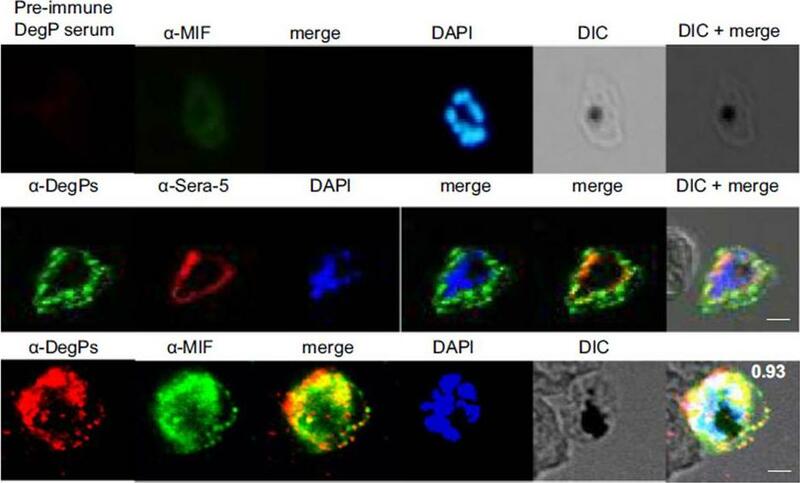 I. PFB0340c (PF3D7_0402000) localizes to the parasitophorous vacuole membrane. Fixed smears probed with rat anti-PF3D7_0402000 (0402000) and anti-PfSERA5 (SERA5) to test for co-localization (Merge). Parasite nuclei were identified with the nuclear stain DAPI, and infected erythrocytes imaged in brightfield (BF).II. PF3D7_0402000 colocalizes with a sub-population of 4.1R. Immunofluorescence microscopy of air-dried smears of 3D7 P. falciparum-infected erythrocytes probed with rabbit anti-4.1R (green), rat anti-PF3D7_0402000 (red) and the nuclear dye (DAPI). 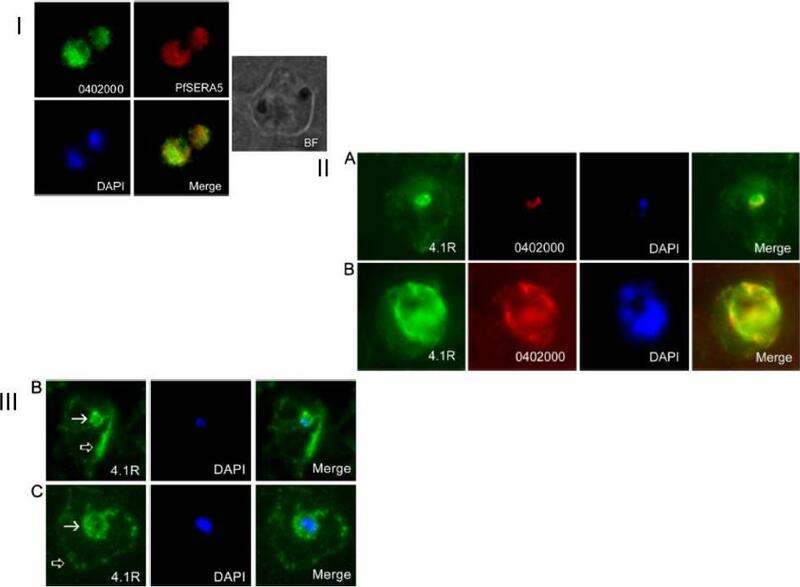 PF3D7_0402000 and 4.1R colocalize in early (A) and late (B) trophozoite stage parasites.III. A subpopulation of 4.1R is found at the PVM in Plasmodium falciparum-infected erythrocytes. Immunofluorescence microscopy of air-dried smears of 3D7 P. falciparum-infected erythrocytes probed with rabbit anti-4.1R (green). 4.1R consistently localizes near the erythrocyte plasma membrane(black arrows), but in early (B) and late (C) trophozoite-stage parasites, a subpopulation of 4.1R is found in close apposition to the parasite, asdetected by DAPI staining (blue).Parish LA, Mai DW, Jones ML, Kitson EL, Rayner JC. 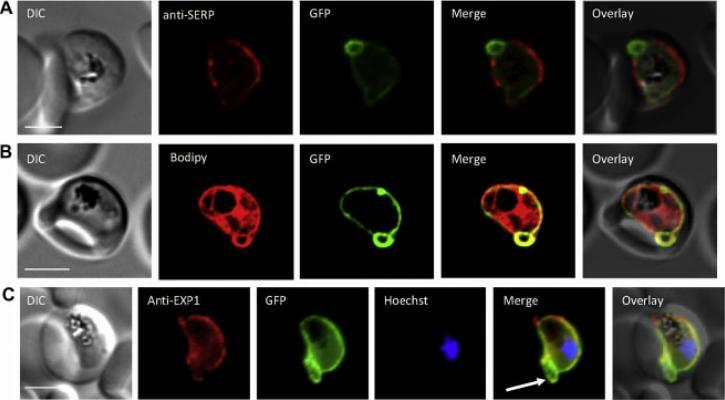 A member of the Plasmodium falciparum PHIST family binds to the erythrocyte cytoskeleton component band 4.1. Malar J. 2013 12(1):160. Indirect immunofluorescence assay and confocal microscopy of late stages of P. falciparum-infected erythrocytes and free merozoites. P. falciparum parasites were probed using rat anti-DegP antibody followed by fluorescein isothiocyanate-conjugated anti-rat IgG (green). Other marker proteins were stained with the rabbit antiserum/ antibody followed by Cy3-conjugated anti-rabbit IgG (red). The parasite nuclei were counterstained with 4′,6-diamidino-2-phenylindole (DAPI) (blue), and slides were visualized using a confocal laser scanning microscope. z-section of late-stage parasites stained for DegP showed green fluorescence signals in the cytosol of the parasite and the cytosol and membrane of infected RBCs (Ci). DegP signals were observed on free merozoites (Cii). The surface localization of PfDegP in infected RBCs was confirmed by co-localization with an erythrocyte membrane marker (red) (Di). Yellow spots indicate merged fluorescent signals from DegP and band 3 antibodies (Dii). 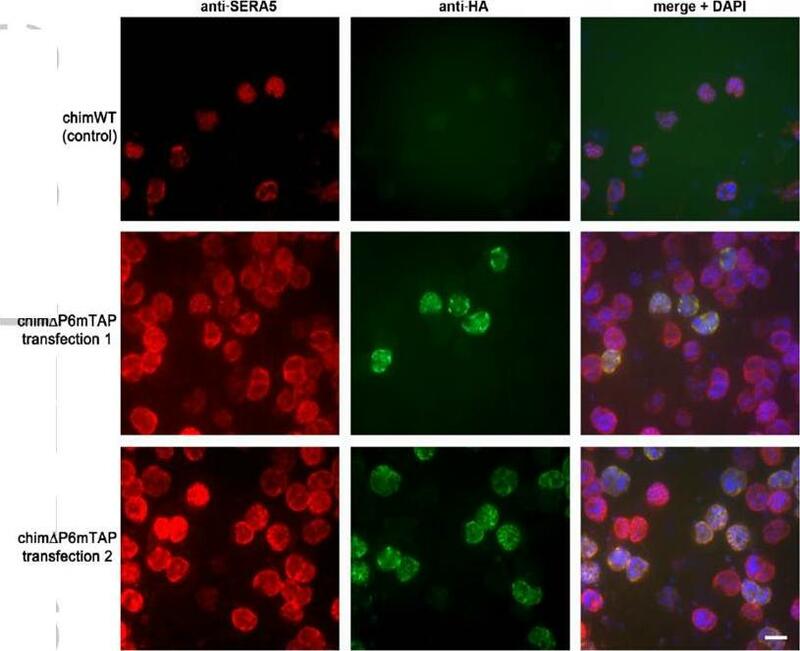 SERA5 and MIF were used as markers for parasitophorous vacuole and secretory protein in the culture supernatant, respectively. Sharma S, Jadli M, Singh A, Arora K, Malhotra P. A secretory multifunctional serine protease, DegP of Plasmodium falciparum, plays an important role in thermo-oxidative stress, parasite growth and development. FEBS J. 2014 Mar;281(6):1679-99. Indirect immunofluorescence assay and confocal microscopy of late stages of P. falciparum-infected erythrocytes and free merozoites. P. falciparum parasites were probed using rat anti-DegP antibody followed by fluorescein isothiocyanate-conjugated anti-rat IgG (green). Other marker proteins were stained with the rabbit antiserum/antibody followed by Cy3-conjugated anti-rabbit IgG (red). 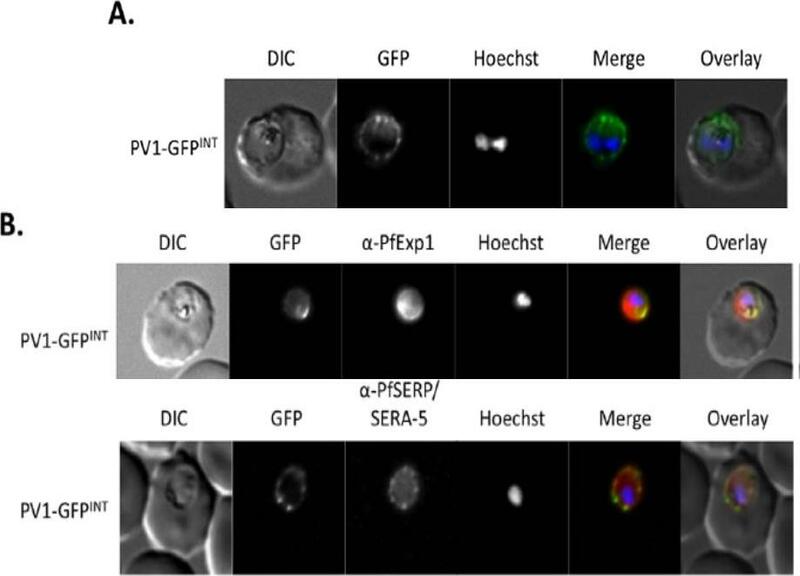 PfSera5 and PfMIF were used as markers for parasitophorous vacuole and secretory protein in the culture supernatant, respectively. Significant merging of the fluorescent signal for DegP was observed with SERA5 and MIF signals, indicating the presence of DegP in the cytosol of infected RBCs.Sharma S, Jadli M, Singh A, Arora K, Malhotra P. A secretory multifunctional serine protease, DegP of Plasmodium falciparum, plays an important role in thermo-oxidative stress, parasite growth and development. FEBS J. 2014 281(6):1679-99. 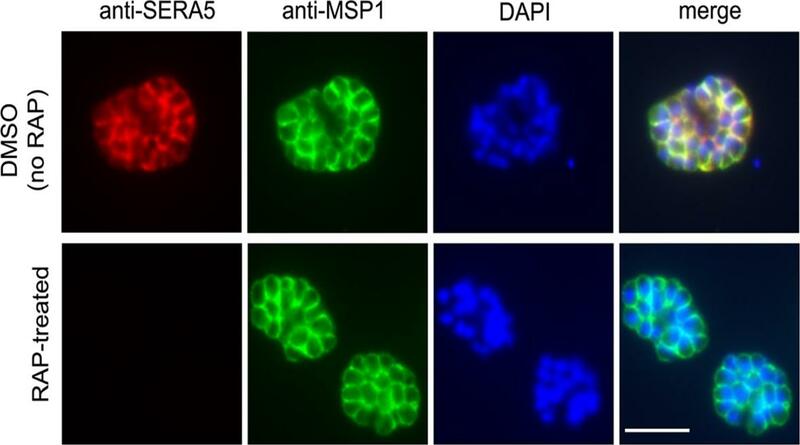 Peripherally associated proteins MSP3, MSP7, SERA4, and SERA5 are shed during invasion. Invading merozoites were labeled with PfRON4 as a marker of the tight junction (green) and colabeled with antibodies directed against MSP3 (A), MSP7 (B), SERA4 (C), or SERA5 (D). All proteins were shed at the point of tight junction, with antibody reactivity to the merozoite surface being observed only on the proportion of the merozoite external to the RBC. All primary antibodies were used at a 1:100 serum dilution, and secondary antibodies were used at a 1:500 dilution.Boyle MJ, Langer C, Chan JA, Hodder AN, Coppel RL, Anders RF, Beeson JG. 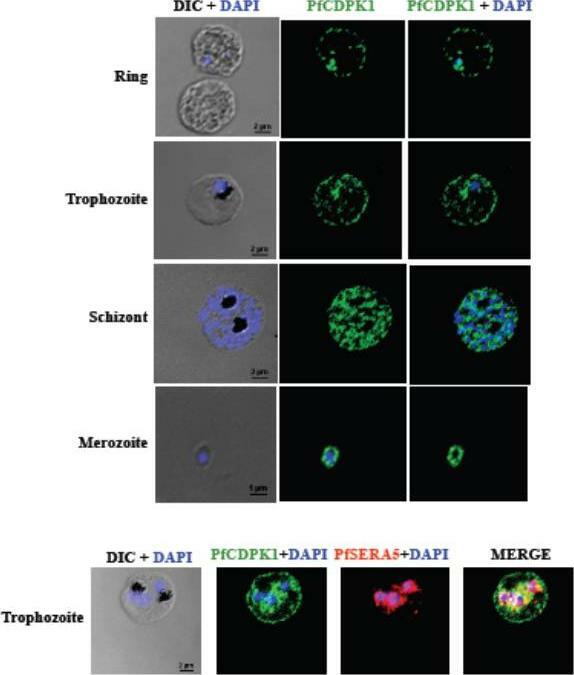 Sequential processing of merozoite surface proteins during and after erythrocyte invasion by Plasmodium falciparum. Infect Immun. 2014 82(3):924-36. Truncation of MSP1 Produces anEgress Defect (A) Predicted RAP-induced MSP1 truncation in the 3D7MSP1flox42C clones, showing loss of the GPI anchor and C-terminal domain containing the mAb X509 epitope. (C) RAP treatment produces a loss of mAb X509 reactivity and a shift in the IFA pattern of MSP1 to one typical of PV proteins, consistent with the predicted truncation. 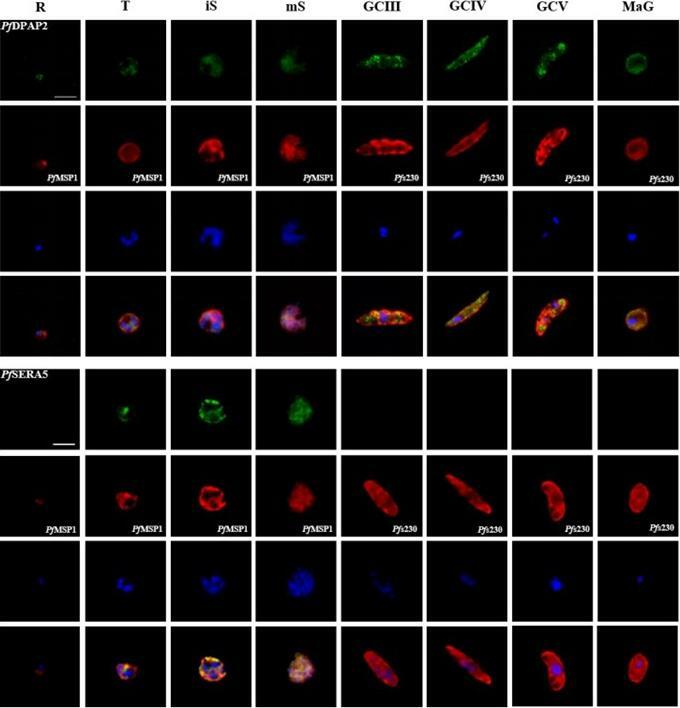 Numbers of DAPI-stained nuclei did not differ between control and RAPtreated. (D) IFA showing co-localization of truncated MSP1 with SERA5 indicating a PV location. 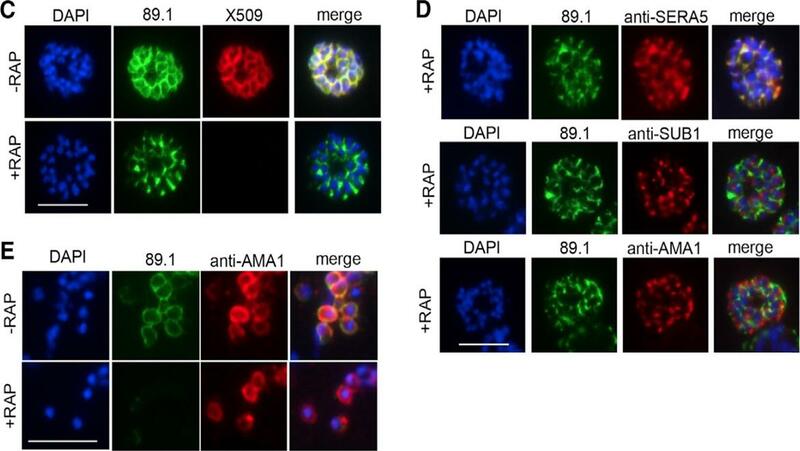 The punctate localization of SUB1 and the microneme protein AMA1 indicates normal organelle biogenesis. (E) IFA showing lack of surface-bound MSP1 on merozoites of RAP-treated 3D7MSP1flox42C1 clone E3. 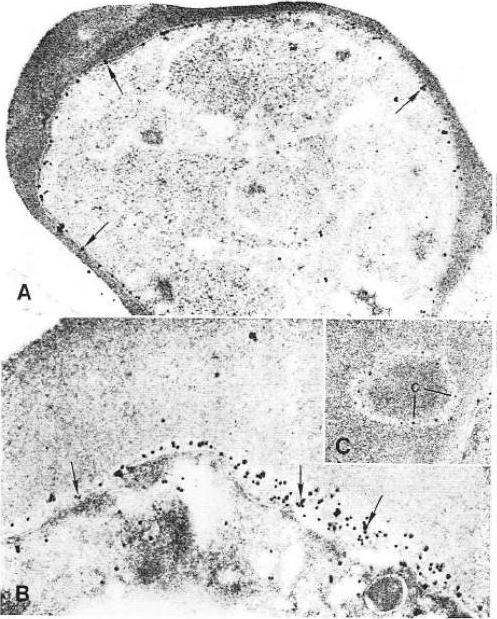 Antibodies to AMA1 (which is expressed on free merozoites) were used as a control.Das S, Hertrich N, Perrin AJ, Withers-Martinez C, Collins CR, Jones ML, Watermeyer JM, Fobes ET, Martin SR, Saibil HR, Wright GJ, Treeck M, Epp C, Blackman MJ. Processing of Plasmodium falciparum Merozoite Surface Protein MSP1 Activates a Spectrin-Binding Function Enabling Parasite Egress from RBCs. Cell Host Microbe. 2015 18(4):433-44. Detection of nitric oxide synthase in both healthy and P. falciparum-harboring red blood cells. 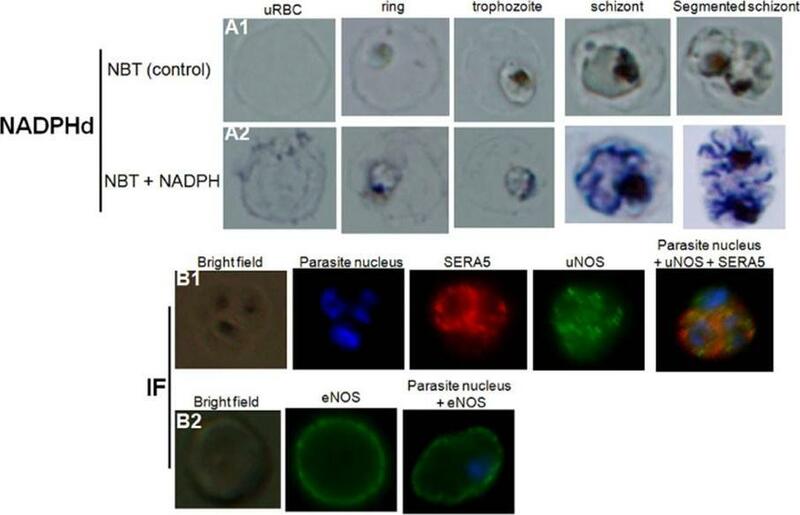 NADPH-diaphorase activity within healthy RBCs or PfRBCs at different stages of parasite development (A). The panel (A1) represents the negative control (uRBCs or PfRBCs incubated with NBT without NADPH). NADPHd staining (blue color) was observed in both uRBC and parasite (A2). Identification by immunofluorescence assay (IF) of NOS within uRBCs or PfRBCs using rabbit polyclonal antibody against uNOS (B1, green) or mouse monoclonal antibody against eNOS (B2, green). To differentiate infected from uninfected RBCs, parasite nucleus was labeled in blue with Hoechst 33342. A monoclonal antibody against parasiteSERA5 was used to localize the parasitophorous vacuole (red).Rey J, Buffet PA, Ciceron L, Milon G, Mercereau-Puijalon O, Safeukui I. Reduced erythrocyte deformability associated with hypoargininemia during Plasmodium falciparum malaria. Sci Rep. 2014 Jan 20;4:3767. To establish the effects of SERA5 loss on parasite growth, we compared the replication rates of mock-treated and RAP-treated floxSERA5-1B6 and floxSERA5-3B6 clones, using the parental 1G5DC clone as a controlIFA of mature schizonts of control (DMSO-treated) and RAP-treated integrant clone floxSERA5-1B6 ~44 h following treatment. No SERA5-specific signal was detectable in the majority (~98%) of the rapamycin-treated population. Scale bar, 5 μmCollins CR, Hackett F, Atid J, Tan MSY, Blackman MJ. The Plasmodium falciparum pseudoprotease SERA5 regulates the kinetics and efficiency of malaria parasite egress from host erythrocytes. PLoS Pathog. 2017 13(7):e1006453. DiCre-mediated conditional disruption of P. falciparum SERA5 expression. IFA of mature schizonts of control (DMSO-treated) and RAP-treated integrant clone floxSERA5-1B6 ~44 h following treatment. No SERA5-specific signal was detectable in the majority (~98%) of the RAP-treated population. Scale bar, 5 μm. To assess the effects of SERA5 gene deletion on SERA5 protein expression, mature flox-SERA5-1B6 and floxSERA5-3B6 schizonts were examined by indirect immunofluorescence (IFA) at the end of the first erythrocytic cycle (~44 h) following RAP-treatment. No SERA5-specific signal was detectable by IFA in most of the RAP-treated floxSERA5-1B6 and flox-SERA5-3B6 schizontsCollins CR, Hackett F, Atid J, Tan MSY, Blackman MJ. The Plasmodium falciparum pseudoprotease SERA5 regulates the kinetics and efficiency of malaria parasite egress from host erythrocytes. PLoS Pathog. 2017 Jul 6;13(7):e1006453. IFA shows a loss of reactivity of PfACT1 KOs to the anti-PfACT1 antibody. The PV is depicted in red (Sera-5). Scale bar 5 μ. PfACT1 disruption was apparent by immunofluorescence assay (IFA) in schizonts 44 h post-induction. Based on IFAs, it was estimated that ~98% of the population had undergone excision of pfact1, resulting in an almost pure population of pfact1 disrupted parasites (PfACT1 KO) for phenotypic analysis. Only a weak, potentially non-specific signal could be detected by IFA in PfACT1 KO schizonts.Das S, Lemgruber L, Tay CL, Baum J, Meissner M. Multiple essential functions of Plasmodium falciparum actin-1 during malaria blood-stage development. BMC Biol. 2017 Aug 15;15(1):70.